Surrounded by Mohonk Preserve lands, this mid-century beauty possesses the spirit of Frank Lloyd Wright with its tranquil blend of wood, stone and glass. 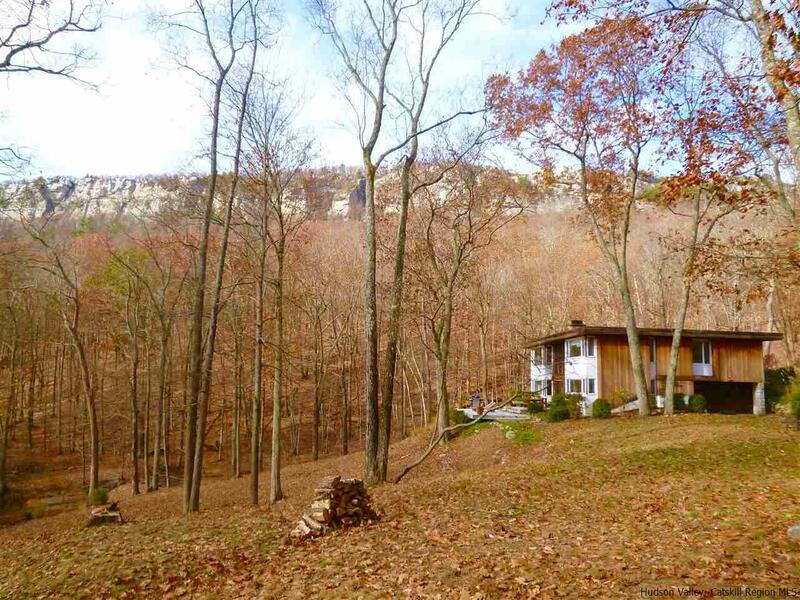 Along with the privacy and tranquil calm of a rushing stream and swimming pond below, there is such a sense of drama created by the Gunks' white cliffs backdrop, visible as you drive in and just a short hike away. Once inside the marble tiled entry, the home's open floor plan welcomes you to the world of light and nature with shimmering views of trees, cliffs and water from all directions. The striking two story stone fireplace brings a natural element to the inside creating balance and connection between the two living levels as well as with nature. Truly a living space that brings the outside in, you will enjoy the peace and serenity both inside and out. Take in the sounds of the rushing stream while enjoying coffee or cocktails from the curved deck tucked behind the house, or watch the wildlife at the pond while sunbathing on the lower deck. Although the flow of the home is open plan, there is still good separation between sleeping and living areas so you will never feel cramped or "on top of each other". In addition to the 3 Bedrooms and Den, there are 3.5 bathrooms, an attached garage PLUS a detached 2 car garage that could be great studio space or a future guest house. The kitchen is well equipped with Thermador and Sub-Zero appliances - a pleasure to cook in. Owners purchased additional acreage to ensure privacy for years to come and although under 5 acres total, this property enjoys the status of adjoining forever wild preserve land. Under 2 hours to NYC and 10 minutes to New Paltz, you can enjoy whatever your Hudson Valley pleasure may be - Rail Trail, Climbing, Hiking, Skydiving, Kayaking, Wineries, Orchards, Breweries, Spa at Mohonk, Shopping and restaurants nearby. Currently making money on AirBNB with a local host, you too could continue to rent when not using the house. Bedroom 1 Room Size: 17x15'7"
Bedroom 3 Room Size: 15x14'9"
Dining Room Room Size: 20x11'3"